Do you share holidays? Feeling lost without the kids? I’ll be giving you suggestions on how to handle those tough holidays when the kids are with the other parent. Don’t worry your momma heart will get through it! When I talk to single moms one of the topics that never fails to arise is… the father of their children. Unfortunately, once the subject is broached there usually follows a tirade of emotion. I get it. I’ve been there and it isn’t easy. But, these conversations always makes me think about the healing process and what a complicated and delicate journey it is to heal from a divorce or separation especially when a child is involved. It’s interesting, I’ve spoken to women who have been divorced for years and as soon as the ex-factor comes up it is like they are transported back into time and can recall every single terrible thing they went through. It isn’t surprising because ties are ties and when a trust is broken or violated it sticks with us like a scar and if we start picking at that scar or scab that old wound just starts bleeding again. How often do you pick at your ex-scab? This is not a bad way to deal with our scabs from the father of our children. How you say? Well, let’s break it down. Clean It- This has more to do with you then him. There comes a point when you have to come clean. Take responsibility for your part, be accountable. When we start the purifying process it takes us looking back, laying it on the table honestly, asking for forgiveness for our own actions and asking God to grant us a pure heart and mind when it comes to this relationship. When you clean yourself from all the dirt, grime, and residue left behind then your attitude changes. Remember it really does begin with you. This isn’t an easy process it may take years but it will give you freedom. When we leave a wound unclean it gets infected and can spread. Stop it from spreading and infecting the other areas of your life with your family and even the possibility of love again. Don’t Pick at It- What is it about scabs that make them so tempting to pick? Just when that wound is being covered and trying to grow a new skin we want to dig away at it? When we constantly rehash the past and pick apart every bit of that relationship, every argument, every hurt we take away the ability for our wounds to heal. We don’t give that new skin a chance because we keep ripping it off and it keeps bleeding. There comes a point where you have to accept that you fell, you got hurt, but then you have to get up and heal. If you want to have any type of cordial relationship with your ex stop picking at the wound between the two of you. This is hard. But, you have a choice you can either live bleeding and injured or you can live healed with a scar that fades more and more every day. Let it Heal-Have you ever heard people say that you need to let your scab breathe? Give yourself time to breathe. Don’t expect your scar to disappear in a few days or even a few months. But, take off the band aid, run, play, enjoy life and breathe in all that is good and exhale all that doesn’t serve you. Be kind, be compassionate, be gentle with your injury and take care of yourself and allow time for healing. You and your family deserve it! We’re going to get lots of bruise on the bumpy road of life, but if we know how to take care of them we can move forward a little easier. Wishing you a healing today! I may have just touched a nerve with a whole bunch of women out there, so if you get annoyed with me it’s okay I get it, but I think it is important to be honest about the one relationship is vital to our children’s well-being… our relationship with their father. I’ve said it before and I’ll say it again this is a complex relationship full of emotions, struggles, sometimes anger, and even sadness. I won’t sugar coat that this is a multi-layer relationship with lots of history that is often difficult to navigate. Do I always get along with my daughter’s father? No, I don’t. We go through deep valleys and high peaks, it can be an ebb and flow type of thing, but the bottom line is we are both her parents and it does matter that we do the best we can for her and that doesn’t happen by trying to rip each other apart. Here’s what I’ve found… Complaining about your child’s father changes absolutely nothing. If anything it keeps you wrapped up in a pattern of anger, bitterness and frustration. I understand we all need to vent and get our feelings out, but what I am talking about is the constant harping and bad mouthing that keeps you stuck in the past and in chains. I understand that everyone’s situation is different and some are really severe so it can be hard not to want to go in on him, but this hurts everyone. Life is short do you really want to spend it caught up in a ball of anger? I’m not saying that if there is something that needs to be improved or changed then you shouldn’t pursue whatever steps need to be taken, but don’t you want to strive for peace? So I’m proposing to stop complaining and start praying for the father of your children. Make a commitment for 30 days to 1) pray for him, 2) ask the Lord to change your relationship and make it one of peace, compassion and understanding, and 3) for the Lord to reveal to you how you can change to improve the relationship. Envision how the relationship would need to evolve for it to be healthy for everyone especially your children and start praying for God to make it happen. Every time you’re ready to complain… pray. Do you stop after 30 days? No, my hope is that this is a constant prayer. But, make a commitment every day to pray for him by starting out with 30 days. I’m not trying to make light of any situation out there, but I do believe that God changes hearts! This is as much about you as it is about him. The Bible tells us in Philippians 1:27 “Whatever happens conduct yourselves in a manner worthy of the gospel of Christ.” This passage reminds me that I have a responsibility regardless of the situation to conduct myself as a child of Christ. No one said it would be easy, but I am accountable. Nothing fruitful can come from complaining but real change comes from praying! So what do you say? Will you commit to praying for the father of your children for 30 days? I have 2 friends who are going to make a commitment with me and I can’t wait to see how God works! Let’s do the right thing in God’s eyes and for our families! Kids With Dad On Easter? Celebrate Early and Create Memories Anyway! The Easter Bunny came early to my house this season! This year Anya spends spring break with her dad. You know it is that thing that happens when two people separate and have a kid together. But, a while back I decided not to allow tradition and celebrations to be broken because of a schedule. On Tuesday I put together an Easter basket and did a little Easter decorating so that we could still celebrate together. I made all of Anya’s favorite foods for a pre-Easter dinner and we spent the day dying Easter eggs, baking an Easter Bunny cake and finished off the evening cuddling in bed watching the Gospel of John. Our pre-Easter bash lifted our spirits and made both of us feel as though we were still celebrating the holiday together. I know it’s difficult and heartbreaking not to spend these special days with your kids, but I encourage everyone to work around it so you can still celebrate as a family and create some memories. Don’t allow the situation to define whether or not you make these moments special. Take a look at the some of the fun we had! Easter came early!! Pulled out the decorations and had a small scale surprise! Don’t you love Easter colors? So pretty! Each egg had a surprise! It was a mini egg hunt. The bunny cake was so much fun and yummy! Heavenly Father, I know that you are with each and everyone of us. You know us so well because you created us, you know every hair on our head and you know when our hearts are swelling with pain. Father, I ask that you surround every momma tonight who is missing her baby with your all encompassing love. I humbly pray that you fill the void we are feeling in our homes and our hearts this holiday season. God so many of us are hurting and although we want our children to spend time with their families, we miss them. Lord you are the ultimate healer who can mend the deepest wound and so I ask you to touch my sisters out there tonight who need your healing hand. If their children are experiencing any sadness, please restore in them a peaceful heart. God take each of these mother’s hearts and hold it close to you let them know that you are there for them in every circumstance and will never forsake them. Please take away the loneliness they are feeling and let them feel your holy presence and light in their life. In Jesus’ name… Amen. I’m super big on traditions! Every year Anya and I have a number of traditions that we do to make the holiday meaningful. Anya is with me every Christmas Eve and Christmas Day until she goes over to her dad’s house on Christmas day around 4:00. So, leading up to Christmas we do Advent, go see the Muppets Christmas Carol then change into pjs and ride around looking at lights while sipping hot chocolate, we see the Nutcracker, I hide Advent boxes, we make cookies, decorate, and so many other things that when she leaves on Christmas Day we are both okay because we’ve spent so much quality time together. Whatever it is you enjoy doing as a family make it a tradition so you and your kids have something to look forward to each year, regardless of the access schedule. Some of you may cringe at celebrating the holiday early, but what’s important isn’t the day it is the time you spend together. Anya will be with her dad this Thanksgiving, so on Wednesday we are both off of school and work. I ‘m cooking all her favorite foods and we’re going to have a Thanksgiving dinner before she leaves. We are also going to bake and watch a few Christmas movies which is what we do every year. Although not ideal, we are still celebrating the holiday together. Do what you have to do and don’t get caught up in the logistics. Make that Thanksgiving or Christmas dinner a day or two early and do everything you would do if you were spending the holiday together. If you are able to spend time with your parents or friends while your children are gone for the holiday do so! This is a perfect time to catch up with those you love and enjoy a little adult time. Go shopping with mom, meet an old friend from your hometown for dinner, or go see that Aunt who can’t get out of the house. Nurturing your relationships with your family and friends is great way to feel better and show your appreciation and gratitude for them. Be indulgent! Go ahead book a day at the spa, catch two movies at the theater back to back, go to a hotel for the night, take an impromptu road trip, read in the tub for hours, host a party, anything that is fun I suggest you partake in! You deserve it you’re a mom!! Maybe set aside a little cash during the year to go on a weekend trip with yourself or girlfriends when you know the kids will be with dad on the holiday. It’s okay to have fun also! Make a deal with yourself that when the kids are gone for the holiday that you will try something new. This is a great way to get out of that slump! Make a list of new things you want to try and take advantage of this free time to mark it off your list. If you want to give back the holidays are a perfect time to do just that! This is the season for giving and not only physical gifts, but gifts of service. When you serve others you’re less likely to think about your own issues because your focus is outward instead of inward. Volunteering can also remind you of what is important and how blessed you are. There is nothing that takes you out of yourself more than when you’re helping others. Make the commitment and volunteer at your church, a shelter, or anywhere that has a need for your service. Holidays are what we create them to be for ourselves and our family. I know it is painful not to be with your babies, but this is an opportunity to create joy for yourself and them. During the holidays take time to pray and ask God for strength. Remember you are never alone he is always right there next to you every step of the way. May you have a blessed holiday season! One of our traditions! 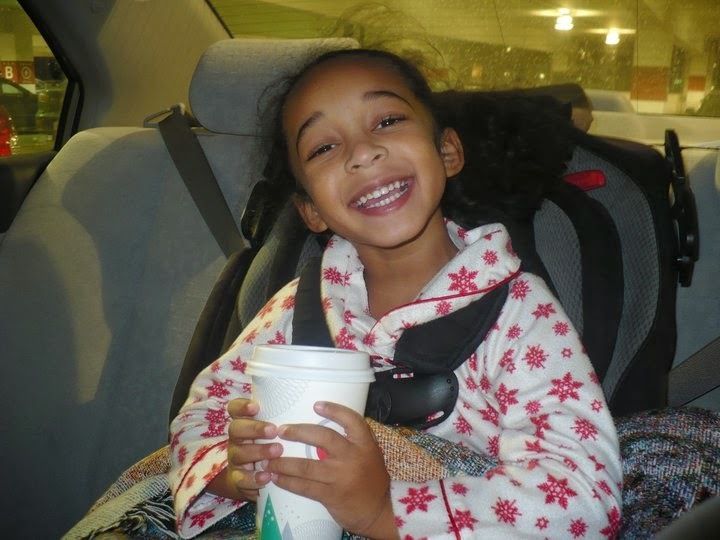 Jammies, hot chocolate and cruising to see lights!